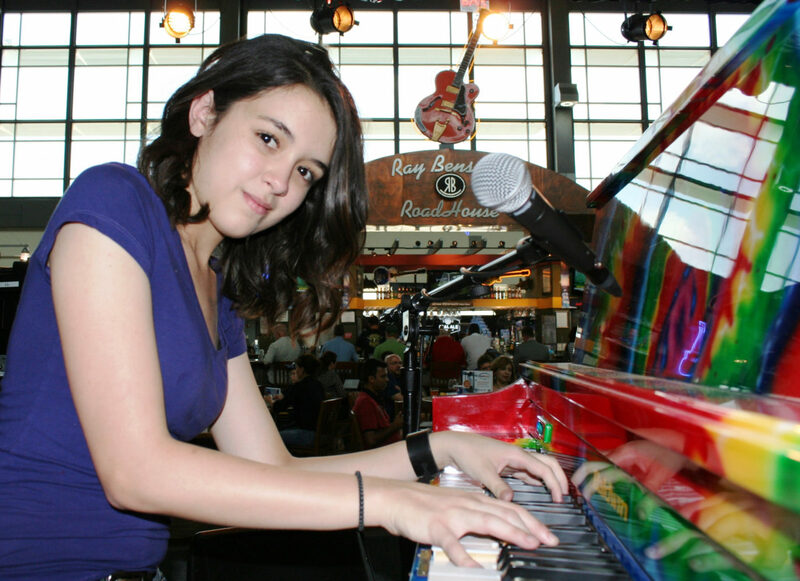 Austin-Bergstrom International Airport is well-loved for its weekly schedule of live, local music and for the great array of local food outlets in the terminals. Now AUS is getting a new “attraction” – a robotic coffee-making machine, courtesy of Austin-based Briggo. The machine will be located across from Gate 8 and travelers will be able to order coffee, hot chocolate or Chai tea via an app or at the machine. App users will get a text when their order is ready to pick up. Briggo says theirs is the first app-based, robotic, 24/7 specialty coffee system installed in an airport, although Orville the robot prepares and delivers coffee in the IT Experience Zone in Terminal 2 at Incheon International Airport in South Korea – photo below. Austin calls itself the Live Music Capital of the World and that claim extends to Austin Bergstrom International Airport, where there are more than 20 live music shows a week. This week is Kid Band Week (July 17 – 21, 2017; Monday – Friday) featuring local musicians and bands ranging in age from 10 to 18 from 3:30 to 5:30 p.m.at the Asleep at the Wheel Stage, located near Gate 10. Friday, July 21 – Austin Young Jazz Warriors (Lamar Middle School Students). I joined Delta Air Lines for the inaugural of its direct flight between Seattle and Austin and had one day on the ground to explore the city and the airport. Base camp was the Intercontinental Stephen F. Austin, downtown on Congress Avenue. The hotel is within walking distance of a food cart corner where we fueled up for the day at the silver trailer named My Name is Joe. The menu includes hearty starts such as Texas Rancher Oats (oatmeal, tomato sauce, poached egg, queso fresco, black beans and avocado) and the proceeds help provide jobs and treatment program funding for service industry workers recovering from drug and alcohol addiction. Next, we set out on a portion of the 10-mile ride and hike trail around Austin’s Lady Bird Lake. 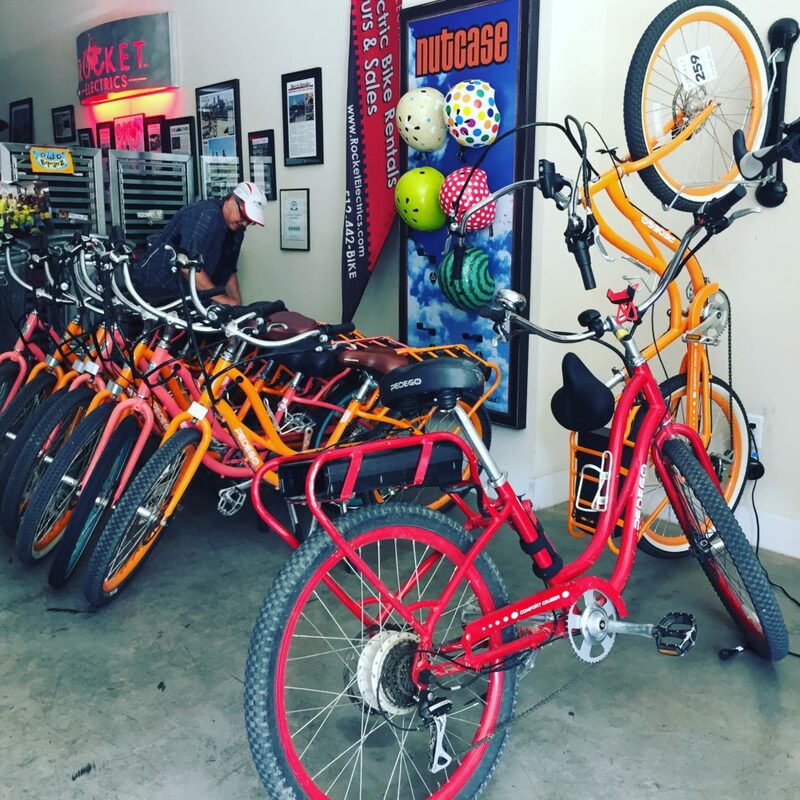 Transportation – and excellent guides – provided by Rocket Electrics , which offers both organized and custom tours throughout the city on fun and surprisingly easy-to-ride electric bikes. Then, it was off to Austin Bergstrom International Airport for a tour. Upgrades galore are underway at AUS airport, with new shops, restaurants, baggage claim and gate areas under construction. One work-around airport officials are especially pleased about are the four temporary jet bridges -or “elevated walkways,” as the airport calls them – that have been set up to keep things moving smoothly at one end of the terminal while a new addition is built. The longest temporary jet bridge is 720 feet and AUS’s Derick Hackett believes it is currently the longest temporary jet bridge in the United States. Record-setting or not, the bridge is so long that the airport has created a marathon-inspired set of posters to encourage passengers on their journey from one end to the other. We also stopped by for a tour of the newly-opened Bark and Zoom pet hotel and valet parking center right next to the airport, where dogs and cats can be pampered while their people are away. In addition to the upgraded suites where pups can watch cable TV all day (CNN was playing when we toured, but programming is usually Animal Planet), we got to see the guitar-shaped pool pups gets to play in. Notice the “No Diving” sign…. Austin-Bergstrom International Airport celebrated the opening of its new $3 million, 30,000-square-foot South Terminal last week with a party on the terminal’s patio, live music, a ribbon cutting ceremony and a water cannon salute for the first flight: Allegiant’s Air’s Austin – Albuquerque nonstop. The 3-gate South Terminal is in a building that dates back to the original Bergstrom Air Force Base that once occupied the area and is totally separate from the airport’s main Barbara Jordan Terminal. The look of new facility invokes “the nostalgia of mid-century travel, with stylish retro 70s architecture and décor,” according to the airport, and features colors and textures native to Texas Hill Country and white canopies (outside) onto which changing colors will be projected. Passengers will go outside to board their planes on ‘old-fashioned’ stairs. Indoor amenities include charging stations, water bottle refill stations, grab-n-go sandwiches and drinks, with an outdoor patio area with seating, a pet relief area, and a food truck. There’s also a stage for live music and plans for a food-truck style indoor eatery as well. Allegiant Airlines is now operating its 10 non-stop Austin flights out of the new terminal and Sun Country Airlines and ViaAir will move operations over to the new terminal later this year. Annie, from Annie & Kate, performing on piano for Kid Band Week, 2015. This is the 10th annual Kid Band week. It runs July 18 – 22, 2016 (Monday – Friday) and features performers ranging in age from 14 to 18. These aren’t thrown-together kiddie bands; these are top notch performers (it’s Austin, after all) who just happen to be young. All performances run from 3:30 to 5:30 p.m. at the Asleep at the Wheel Stage, located near Gate 10. Monday, July 18 – Grace London (Singer, songwriter, guitar player, foot stomper. Age 16): . Friday, July 22 – Dillon Havins Band (Americana, Alternative Rock band, ages 16 – 18). If you’re heading to Austin, be sure to check these bands out. Next time through, you may have to pay a lot more than nothing to see them.